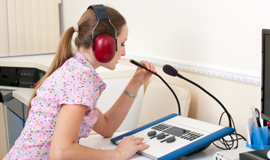 What is assistive technology for hearing loss? Clearly anything which fosters communication may be considered “assistive technology.” There are now many services and devices that help serve as assistive technology for individuals with hearing loss, although that may not have been their intended purpose. Examples of these include: texting, tweeting, email, short message relay (SMS), fax, computers and tablets (e.g., Dell Latitude, iPad) and software, for example Skype. Of course, the more traditional devices are still available such as amplified telephones, signaling devices, alarm clocks and TV listening devices to name just a few. Additionally hearing aid manufacturers are providing linkup capabilities between their hearing aids and other devices such as cell phones, FM systems, and home devices for TV and telephone, among others. It is probably the case that most individuals with hearing loss will be unaware of the variety of technological assistance available to use in conjunction with their hearing aids or separately from their hearing aids. As their vocational rehabilitation counselor, letting them know to ask their audiologist about these devices will be providing them a great service and could well mean the difference between succeeding and not succeeding. While many audiologists may not stock these devices, the audiologist is the best professional to help sort this out for the client and gather the information needed as to which devices will work and/or work best with that client’s hearing aids. One very good resource for information about hearing assistance technologies is Demystifying Hearing Assistance Technology, a guide written specifically for service providers and consumers. This spiral bound book is also available as a pdf file. An assessment for assistive technology will consist of several pieces, including the audiologic information, physical capabilities of the client, specific needs for the home, specific needs for the work setting and lifestyle needs of the client. In 2006 a task force convened by the American Academy of Audiology (AAA) published guidelines for audiologic management of adults with hearing loss. These guidelines, while not mandatory, give audiologists an evidence base as well as ideas and resources to provide thorough treatment and care for these clients. The guidelines contain steps for assessing the individual’s hearing needs and goals as well as non-auditory aspects of the client that could impact management of the hearing loss such as manual dexterity, vision, locus of control, support network available, among other items. Finally, the guidelines suggest that assessing outcomes for each individual patient is an important activity for the audiologist to undertake. 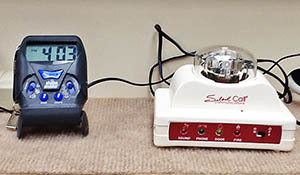 Examples of some instruments audiologists might use to assess the client’s perception of their own communication needs and goals include: the Client Oriented Scale of Improvement, Hearing Handicap Inventory for Adults, and Expected Consequences of Hearing Aid Ownership, and many others. As you might think, assistive devices are quite useful when the sound source is separated from the listener and also in difficult-to-hear situations such as in background noise. Various methods for transmitting sounds from a sender to a receiver have been developed over the years and will be explained later. There are several new programs designed to help people ‘relearn’ how to listen either with or without personal amplification which are designed to be used on a person’s home computer. The information below is taken from hearingresearch.com. Seeing and Hearing SpeechThis program is distributed by the Sensimetrics Corporation in Somerville, MA. 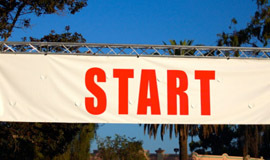 It is an English version of a training program first developed in Sweden. The program consists of four major groups: (1) vowels, (2) consonants, (3) stress, intonation and length, (4) and everyday communications. Each group is broken down into further subgroups and then subdivided further. A brief explanatory note precedes each lesson that explains the articulatory movements required during sound formation as are various communication tips. This program was developed by Dr. Nancy Type [sic] Murray and is now being distributed and published by the Central Institute for the Deaf in St. Louis. The entire program comes in three packages, with two designed for hearing-impaired children and the third, the one that will be reviewed below, aimed at adults and teenager with hearing loss. This package consists of five CDs that present the three training modules. The Sounds program is contained on a single CD (the other two require 2 CDs each). There are 24 exercises in this program consisting of tasks basically requiring consonant discrimination (judging whether one differs from another) or the actual identification of consonant combinations gradually increased in difficulty. A user has the option of just listening, just looking, or both in combination. Sound and Beyond was developed by the House Ear Institute (in Los Angeles) and is now being marketed by the Cochlear Corporation. It is an auditory training program primarily designed for cochlear implant users (though it may also be useful for hearing aid users with severe or profound hearing losses). 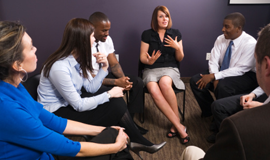 The program consists of a variety of listening tasks ranging in difficulty. Assessment tests determine the level at which training commences for the eight modules. The user manual also contains a printed series of questions to aid a subject in determining the proper level to begin training. It is recommended that users monitor their progress by periodically retaking the tests. All modules provide for immediate feedback when errors are made and include a menu bar that permits a user to stop, pause the session, or to replay the last presentation. This allows the user to replay a sound as often as desired. There are two categories for transmitting sound waves between devices: hardwired and wireless. The distance between the speaker and listener is limited by the length of the wire between the microphone and the receiver, which makes these devices useful in particular situations, for example at a customer counter such as a bank teller, pharmacy or in a physician’s office. An individual may carry hardwired devices as well to interact with individuals they encounter day to day; however, most people find this type of device cumbersome, awkward, as well as providing a negative image to communication partners. Again, however, there are some situations in which hardwired devices work quite well; if an individual is working with a person who interacts with the public in a one-to-one fashion, a hardwired device may answer the employment needs of that individual and it certainly fits well with the Americans with Disabilities Act. 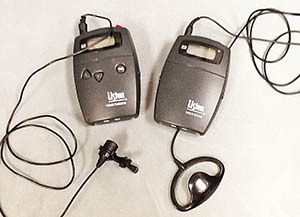 Perhaps the best known device in this category, often called personal assistive listening devices, is the PocketTalker®. The PocketTalker consists of a microphone that feeds into an amplifier, and the amplifier has a volume control and a headphone jack. FM, or frequency modulation, is the same technology used for radio signals, with the difference being the frequencies that are used to broadcast the signals. There are personal assistive listening devices, which operate by FM, rather than a wire; the advantages are that the distance between the speaker and listener can be increased and they can even be separated by walls and still communicate. These personal FM systems have two components: a transmitter, which has a microphone input and often, a channel selection switch, and the receiver, which has a volume control, a channel selection switch and a headphone jack. While these devices are an improvement over those that are hardwired, they are still seen by many to be cumbersome and provide a negative image. As with their hardwired cousins, there may be employment situations in which these devices are acceptable. FM technology has been incorporated into many devices and most hearing aids now come equipped with or can be equipped with an FM receiver. This particular technology change has resulted in greater ease of communication for those with hearing loss in many settings such as theaters, worship places, schools (including colleges and universities), and others. Pictured is a FM listening system. 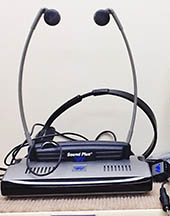 With induction loop or telecoil technology the sound is converted to a magnetic field and sent to a receiver where it is converted back into sound. Notice in the drawing that a necessary part of the system is that the listeners are seated inside the area that is surrounded by the actual wire loop, unless an entire space is looped. This means that individuals with hearing loss who choose to use this technology may be limited in where they can sit within the space to receive the signal. However, now it is common for all the space to be included within the loop. Some people think that loop technology is “old,” and it is true that this electromagnetic technology was the first wireless hearing technology to be developed. 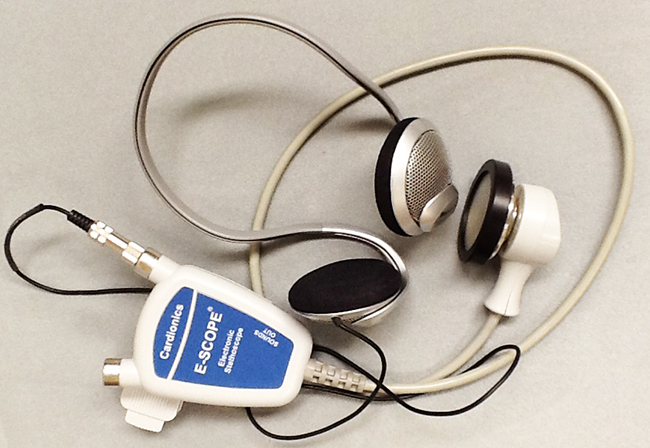 However, it is also true that induction loops/electromagnetic technology is one of the least expensive methods for large spaces to provide auditory signals to individuals with hearing aids, bone anchored implants and cochlear implants, many of which are equipped with the necessary receiver, a telecoil. Additionally, many newer personal amplification devices have an “automatic” program that will “read” the environment and switch the input to the telecoil in that situation. Know, however, that this “automatic programming” will not be 100 percent successful. Infrared technology works on the same idea as both FM and induction loop in that the signal is fed into a transmitter and picked up by a receiver. The difference between infrared and the others already discussed is that the sound is converted to a light wave to be transmitted through the air. Infrared does have some drawbacks: 1) The transmitter and the receiver must be in direct line of sight with one another; infrared, as with any type of light, cannot transmit through walls and not well around corners; 2) This technology cannot be used out-of-doors because sunlight will scatter the signal and essentially destroy it. The first ‘drawback’ might also be seen as a plus because privacy can be better maintained with infrared versus FM signals, which can travel through walls. This signaler is designed for television viewing. Infrared listening technology is not typically used in large spaces, but has been adopted into personal devices for the home. One popular use is with devices designed for television viewing such as the one seen in the photograph. The base of the device pictured serves as the transmitter and has a microphone (not shown in this photo) that is placed next to a television speaker. Once the signal is picked up from the television, the base converts the sound to light and transmits that signal through the front of the base (blue arrow) which is received by the ear buds (red arrow). The receiver has a volume control for the wearer to adjust and also some more sensitive controls on the back that require specialized screwdrivers to adjust how the signal is fed to the left and right earphones. AMPLI600 and PT680 – Designed for emergency situations, these phones include either a remote control or a wrist shaker. 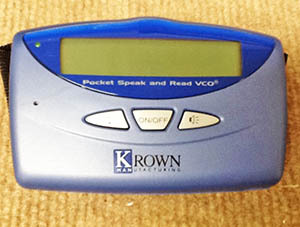 VCO – A voice carry-over telephone that displays the conversation text on the screen. Calls are placed via a relay service. PT500 – The only amplified phone that offers pre-programmed, multiple user profile buttons that memorize volume and tone control for more than one user. 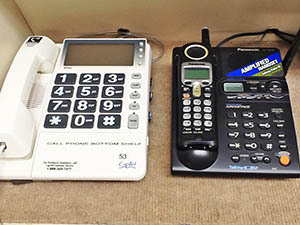 Because there are so many choices for amplified landline phones and accessories, making clients aware of that fact may be the best way to help them. Also, encourage clients to speak with their audiologist in order to make the best decision for their various communication needs. Some of the companies reviewed for this module also carry amplified cell phones. CapTel is now wireless as a free app offered by Sprint (for Android 2.2 and higher) and AT&T (in Michigan). 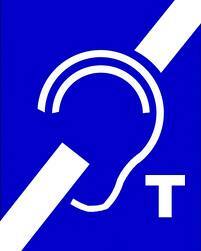 Undoubtedly other cell phone carriers will begin to make this app available for their customers with hearing loss. Many cell phones do have Bluetooth connectivity capability, thus providing transmission capability to a streamer, if the client has that. In addition, of course, cell phones offer texting capabilities, access to the Internet, email and now there are ‘apps’ coming out that can serve as hearing assistive technology. What Are the Critical Cell Phone Features to Consider for the Hearing Impaired? Available in every state, relay services allow individuals who cannot speak and/or hear to call an operator using their own teletypewriter telephone/telephone device for the deaf (TTY/TDD). 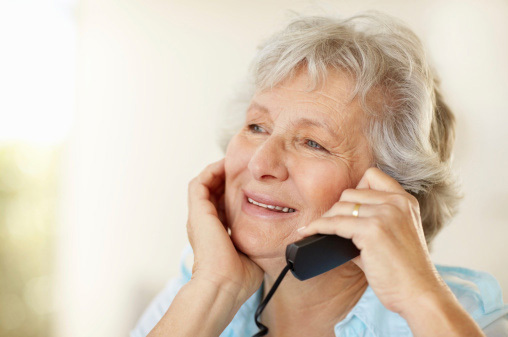 The operator places the needed call and acts as the intermediary for the person initiating the call and the recipient of the call, typically a hearing person without a TTY. Since the advent of the Americans with Disabilities Act, many companies and other entities have established a dedicated TTY line. There are some rules of etiquette for TTY use that, unfortunately, many hearing people are unaware that differ from the spoken telephone conversations with which they are familiar. See the Resource Center’s tools and training for volunteers and service programs and tips on relay conversation etiquette. 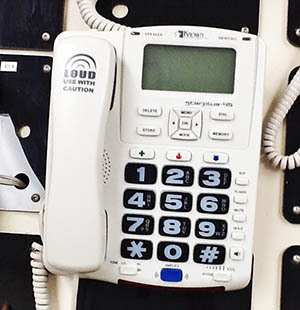 Most often signalers are used in the home to alert a person with hearing loss that the fire alarm has gone off, the phone is ringing, someone has rung the doorbell, or the dryer/oven/microwave oven has signaled. Several of these devices might easily be adapted to the work environment, depending on the particular needs of an individual. In many instances a device with a flashing light is used; many of these are capable of having several inputs which are programmed to a different sequence of light flashes. 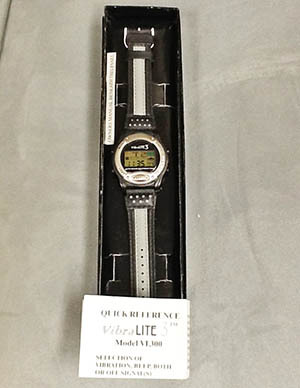 This VibraLite 3 watch has auditory and vibratory signaling capability. There are also 6 different functions available, from hourly alarms to a stopwatch. 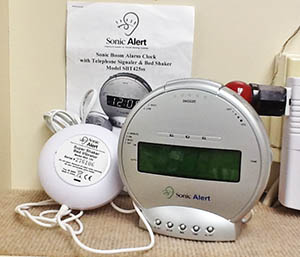 Sonic Boom Alarm Clock (SB1000V) with Bed Shaker Uses lights, sounds and vibration to wake you up. Can be programmed to use the telephone as the alarm. This device allows the user to choose unique flashing patterns for a telephones, doorbell, oven, etc. This is a messaging device for “voice carryover” activities. Typically we think of closed captioning as being used with television, which is the option that is used most often. Movies also have captioning, although theaters may choose to show captioned films only at certain times. For example, in one particular town, one movie theater shows captioned films one Tuesday evening a month. The Federal Communications Commission (FCC) has developed rules governing captioning. Analog televisions of 13” or greater display and all digital televisions must have captioning display capability. In the mid-1990’s Congress began requiring companies who provide programming for multiple channels, e.g., satellite distributors, broadcasters, to caption their television programs. While the main purpose of captioning is recognized as providing text for those who are hard of hearing, English captioning may also help those for whom English is a second (or third) language. Text Interpreting – C-Print, TypeWell, Communication Access Realtime Translation (CART) C-Print. are all used to provide speech-to-text in real time for spoken language. That is, what is being said is typed out verbatim (CART) or at a meaning-for-meaning level (C-Print, TypeWell). The resulting text can be projected for a large group setting, e.g., meeting, symposium, or for an individual, for example in a classroom. All of these methods use specialized keyboards that speed the process of converting the spoken word to text. Notetaking for Group/Individual Situations – Any of the text interpreting services (C-Print, TypeWell, CART ) are appropriate in these situations. In addition, however, there is also ‘computer assisted note taking (CAN),’ which consists of a person using a ‘regular’ keyboard (QWERTY), listening and typing as much of what they hear as possible. Parts of the message may be glossed over, as using a regular keyboard to type verbatim is almost impossible. CAN may be displayed to viewers in the same room as the typist or the typist may be in a distant location, so long as he or she has access to the speaker in real time and the typed message can be sent to the recipient in real time. There are professional CAN operators who not only are very skilled at typing in near real time, but who also use special software and pre-trained codes to improve their accuracy and speed. CAN support of a meeting typically requires one or more CAN operators to be present in the meeting room. One operator is sufficient if the meeting is short, but longer meetings require at least two operators so they can alternate after 20-30 minutes of this extremely exhausting work. It’s also possible to use “Remote” CAN operators. To do this, users need a way to get the audio of the meeting transmitted live to the CAN operator, who may be hundreds of miles away, and a way to get the typed text sent back to the meeting room live and displayed. Skype – This is a copyrighted “voice over internet protocol” (VOIP) that is currently owned by Microsoft. Skype, with its videoconferencing capabilities, allows computer users to communicate through both voice and picture. The advantage of this method for people with hearing loss is easy to understand: they will have access to visual speech cues and/or manual communication. Skype is a software package that can be downloaded to personal computers, both Windows and OS X operating systems. Communication between Skype users is free while Skype to non-Skype use incurs a cost. Skype is not the only software available as VOIP, however, it is unique in that it allows people to directly connect to other users and does not require intermediaries. Facetime – Facetime is an Apple software product that allows video and voice communication, much like Skype. The advantages of Skype also apply to Facetime, visual speech cues and/or manual communication. Calls are placed through address book contacts without need of an intermediary.